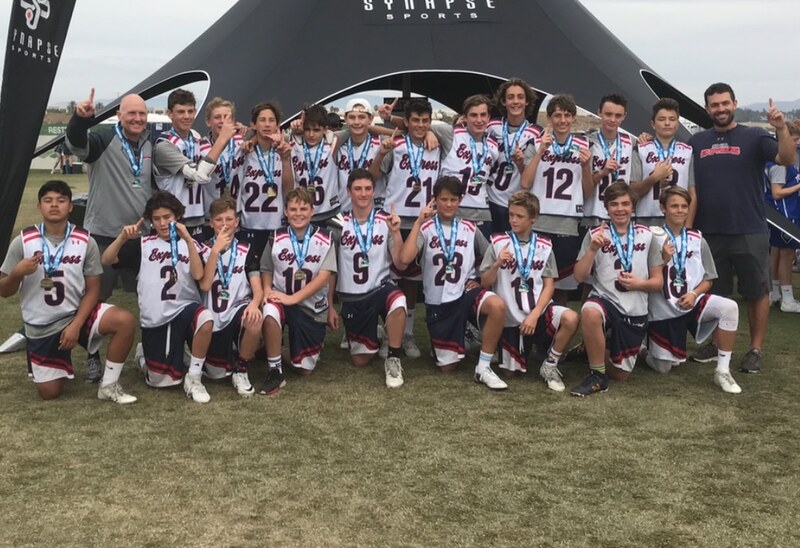 SoCal Express 2022 Black kicked off the winter season by taking the ’ship at Surf Storm this past weekend at So Cal Sports Complex in Oceanside. The team, led by Santa Margarita Head Coach Adam Guy and St. Margaret’s Defensive Coordinator Tom Groeninger, started the two-day tourney on Saturday defeating Mad Dog San Diego 11-0 with well-executed passing and selfless plays on the offense, along with textbook takeaways, clears and ground balls on defense. Express felt things were working well, so they did more of the same against LA Mavericks, keeping the ball on offense for most of the game and ending with a 17-0 victory. In the last game of day one, Express recognized a few friends from Surf Dawgs on the opposite side of the scoring table, but, while the Dawgs gave them more of a fight than they’d seen thus far, So Cal worked together to take down their Newport neighbors 13-4. Lack of opponents’ scoring can be credited to the stellar defensive play of Easton Jellerson, Caleb Richardson, Hayden Chester, Diego Lopez, Nate Warren, and Halen Hickman-Goveia, who showed their finesse and lacrosse IQ as they slid seamlessly and frustrated the opposition’s movement. On Sunday So Cal Express was missing their trusted FOGO Zack Zahr and speedster middie Marcus Lansing due to football playoffs, but offensive middies Andrew Anderson and Lincoln Dodd stepped up at the X and helped Express bring down Mad Dog LA 12-4 and Denver Elite Blue 9-0. So Cal’s perfect record opened the door to the championship game Sunday afternoon against Denver Elite’s Silver Team, who had racked up an equally impressive record with similar scoring against the same opponents. Denver scored first, something Express hadn’t seen all tournament, and when Denver notched its second one, So Cal knew they needed to keep their composure. Express offense, including attacks Makai Todd, Gavin Griswold, Tyler Matthews and Cole Pollard, as well as middies Casey Copeland, Carmelo Higgins, Riley Chester, Matt Groeninger, Will Stahl and Radyn Badraun, stayed true to their plays and selflessly passed and assisted. After Denver’s first two goals, Express scored five unanswered, starting off with two by Groeninger, and then a huge rip on the run by Dodd as the ref counted down to “1” to signal the end of the first half, deflating the Denver sideline. Goalie Sebastien Chicas stuffed a guy inches from the ground and blocked powerful shots from Denver offensive middies who could score on the run. Although Express started the second half up 5-2, Denver slowly started to crawl back, closing it to 5-4 with about a minute left. Express had possession but struggled to keep it in the box. Denver pulled their goalie and picked off the ball to gain possession, quickly transitioned down to their offensive end, and then called timeout with 28 seconds left. When the action started up again, Denver moved the ball quickly around the goal trying to execute as the clock winded down, taking one bounce shot that hit the top of goalie Drew Tyson’s stick, flying over the goal and out of bounds. With 10 seconds left, Denver tried again, and as the ref counted down to “1,” Denver took a final rip down low, only for Tyson to get a piece of it sending it wide, and handing Express the title on a platter. “That won’t be the last time we play Denver in our travels, so it should make for an exciting rivalry down the road,” Guy said. SoCal Express Black is excited about their first tournament victory of the season but is focused ahead on their next stop: Oceanside Hustle on December 2.